Our passion is your story, and it’s beautiful. Let us capture it in timeless portrait art that will live on long after the years fade away. It is the story we safeguard for the generations not yet born and tells of your life, love and legacy to family and friends. It’s the quickly fleeting moments of your life painted by light and adorned to fine papers and canvas to be beautifully displayed and admired forever through the years. 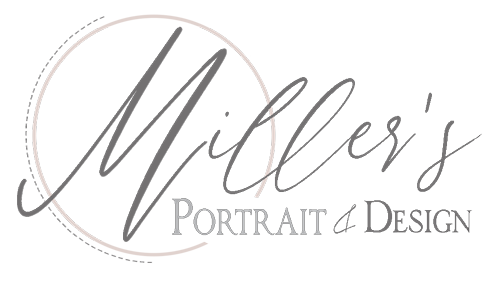 Come see your story unfold at Miller’s Portrait and Design. We strive to provide a memorable experience, beautiful imagery, and heirloom quality albums and wall art from your session. We work hard to keep our images picture perfect with accurate color, tone and quality and printed on the finest archival papers, canvas and acrylics for beautiful display in your home and to share with family and friends for generations to come. Every finished portrait begins with a complimentary pre-session consultation. We invite you to visit our studio or schedule a phone consultation to discuss session and to learn more about our pricing, packages and policies and how we can best suit your portrait needs.